Update: Newsarama has posted the interview i did with them - it's also a good article with more insight into my move to CMX / DC and some thoughts on digital vs. print comics in general. One thing i do need to clarify (because it didn't come off quite right in the article), was the impression that CMX / DC chased me down and aggressively approached me about moving to them. That's not the case at all. My initial interactions with them were (like they are with most people i know who work in the industry) far more casual. Over the years i've come to know a lot of people in the industry, through friends, colleagues, conventions, etc. and had many "if you would ever be interested in working with us, we'd be happy to talk to you about any projects you might want to do after Megatokyo" conversations. After all, as a creator, I was never exclusive to Dark Horse, and other projects (like 'warmth') have always been fair game. To that effect, early last year DC / CMX was one of the publishers i decided to talk further with about the possibility of publishing 'wamrth'. I was surprised by just how interested they were in the title, and in the course of our discussions, i felt that they would not only be a good home for some of my future projects, but for Megatokyo as well. "DC Comic's Manga imprint CMX Acquires publishing rights to Fred Gallagher's Acclaimed Megatokyo Series"
Starting with Volume 4, Megatokyo will be moving to DC comic's manga imprint CMX. In fact, i'm already working on Volume 4, which is slated for release in June. I'm very excited about joining the CMX family as the first Original English Language manga in the lineup. In talking with the DC / CMX folks, I got a strong sense of commonality between what I wanted to do and where they wanted to go with manga. I feel they have an excellent understanding of what it takes to create the kind of work I want to produce and know that they are going to be very supportive of my efforts. 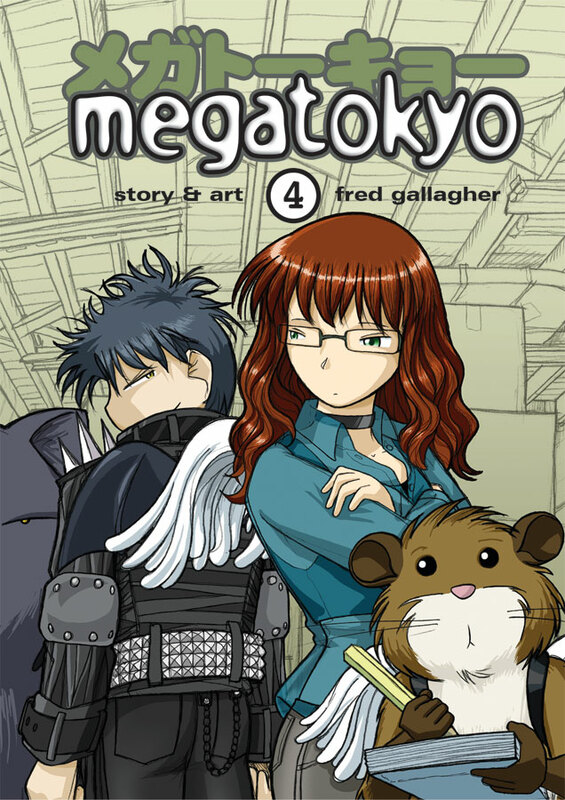 Megatokyo volume 4 will contain Chapter 5 and 6, of which Chapter 6 is some of my best work to date. The primary extra material in this book will be a revised and expanded version of the short story "Circuity" - the online version of which i feel is way to compressed. At 224 pages, this will be the thickest Megatokyo volume to date. I'm very excited about this opportunity to work with DC / CMX, and i'm looking forward to finally releasing what i believe will be the best Megatokyo volume to date.